In a bowl, toss the artichokes with the flour to coat. In a medium size ovenproof skillet, heat the EVOO, four turns of the pan, over medium-high heat. Add the artichokes and fry until lightly golden, about 5 minutes. In a bowl, beat together the eggs, cream, cheese, parsley and nutmeg; season with salt and pepper. Pour the eggs over the artichokes and cook until just set. Transfer the frittata to the oven and bake until set and golden, 10-12 minutes. Let cool, then slice into quarters and serve with the lemon wedges. In Recipes-list.com we have selected the most viewed recipes from category - uncategorized . Enjoy the best recipes specially selected for you! 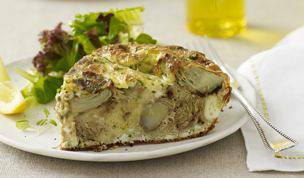 Artichoke Frittata is the right choice that will satisfy all your claims.